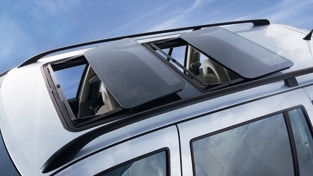 The ways of opening the Hollandia 500 are as individual as the roof itself. The two elegant panorama panels for the front and rear can be operated individually. A very comfortable system that brings fresh air, light and a panorama view exactly where it is needed. In order to ensure their constantly high quality, all Webasto roof systems are tested by the German TÃV and are subject to in-house fatigue tests â including a check of their impermeability in continuous rain, stability under extreme loads and strength, even in Arctic weather. Which is why Webasto gives a year warranty on every unit. Webasto Hollandia 500 The Webasto Hollandia 500 panorama roof. Price includes standard installation in our local area, but excludes additional parts that may be required (please contact us for a specific quotation for you and your vehicle). Although every effort is made to keep prices accurate they will be subject to change and availability.Please click on the individual product for pricing details.